Are you still worried about cleaning the greasy corners of your kitchen? This product enables you to get away from the grind.The design of the infusion bottle, when you clean the kitchen, need press gently only, can press the dishwashing essence.Easy to use. The design of the infusion bottle, say goodbye to the tedious. Press can extrude dishwashing essence, do not waste. 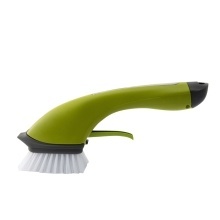 Professional non-slip handle, comfortable grip, do not hurt hands. Effectively remove all kinds of burnt stains. PP brushes remove stubborn stains. Installation and use are simple. Note: The color of the lid of the detergent bottle is random.